-Well… at least I found some great hangover pancakes! On Saturday I visited Charlie’s Coffee Shop in The Farmer’s Market on West 3rd Street in Los Angeles, CA. Now, while I love The Grove, I am not too crazy about The Farmer’s Market; it’s always very crowded, chaotic, and many of the food stations are cash-only. But, because The Farmer’s Market is a Los Angeles landmark, I knew it was important for me to squeeze in a review. 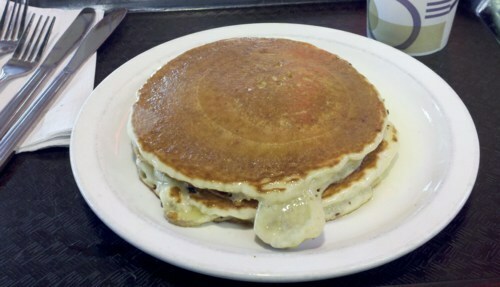 When asking the chefs’ recommendation for my “hotcake” review, they insisted I try the Banana Pancakes. While, according to the menu, it appears as if the hotcakes come with walnuts, turns out they do not. Everything about this pancake was incredibly fresh. The bananas baked into the batter were very obviously handpicked from The Farmer’s Market that day; this notion alone made the pancakes worth a bite. The hotcakes also had an interesting contrast of a crispy, almost crunchy bottom, with a soft, fluffy top. In this sense, the pancake tasted like a toasted banana muffin, which was a pleasant surprise. The problem with these pancakes, as you can see from the photo, is the amount of butter in which they are soaked. If you read my review of Blue Plate, for example, you will see the importance of a glisten on the strawberries, which indicates the freshness of the fruit. When looking at the hotcakes image above, however: the pancake itself should NEVER glisten! This is a sign of too much grease, butter, and who knows what else! Charlie: pancakes are fattening enough, but they can still taste amazing without first running them through a butter churn. It is because of the greasiness of this dish, I have named Charlie’s Coffee Shop’s Banana HotCakes as the #1 go-to pancake for a Sunday morning hangover. I have many more restaurants to review though, so we’ll see how long that title lasts. My other issue about eating these pancakes at The Farmer’s Market is that Charlie’s is right next to a pizza station: how can you enjoy the taste and savor of hotcakes, while smelling fresh-made pizza? You can’t. I did want to give a better review for this pancake station, especially because the competition is so low in The Farmer’s Market; but unfortunately, and surprisingly, The Grove/Farmer’s Market is NOT the place to go for pancakes. That is, unless you had too much Jack the night before. There is something to say though, for the freshness of the fruit, and the way in which the hotcake is cooked. All in all: let’s just say it’s a good thing Charlie’s Coffee Shop doesn’t have Twitter.